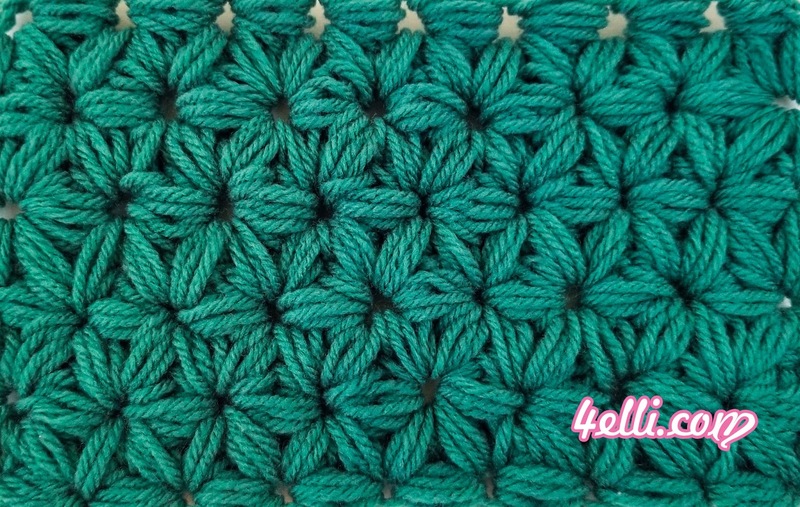 How to crochet the Jasmine Stitch!!! This pattern works with any multiple number of stitches. for this sample make 9 puffs. to make the puffs: make a slip knit and then chain 2, *yarn over and insert the hook into the 2nd chain, yarn over and pull through a loop* repeat from * to * two more times. Yarn over, hold the yarn in the base and pull through all loops, insert the hook into the loop you just create, yarn over and pull through a loop, yarn over and pull through all loops, chain 1. Repeat this pattern working on top of each puff until you have 9 puffs or a multiple number of 3. Row 1: turn, (*yarn over and insert the hook on top of last puff, yarn over and pull through a loop* repeat from * to * two more times, hold the loops on hook and jump into the next space, *yarn over and insert the hook into the next space, yarn over and pull through a loop* repeat from * to * two more times, hold the loops on hook and jump into the next space, yarn over and insert the hook into the next space, yarn over and pull through a loop* repeat from * to * two more times, arn over, hold the yarn in the base and pull through all loops, insert the hook into the loop you just create, yarn over and pull through a loop, yarn over and pull through all loops, chain 1), repeat this pattern across. To finish the row you have o insert the hook on top of last star, into the next space and into the last chain. 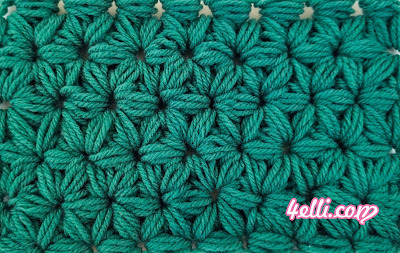 Row 2: turn, make a single puff into the 1st space, and then repeat the same pattern as row 1. o finish the row you have to insert the hook on top of last star, into the next space and into the side space of previous row.